1 Stir water and sugar in a small saucepan over medium heat until the sugar dissolves, approximately 5 minutes. Stir in the honey. Set aside and keep the honey syrup warm. 2 In a bowl, combine the flour with baking powder, soda, salt, and sugar. 3 In another bowl, whisk together the butter, ricotta cheese, egg, orange juice, milk, and vanilla. 4 Combine the wet and dry ingredients just until blended. 5 Gently stir in the frozen blueberries and orange zest, if using. 6 In a frying pan, heat butter over medium heat. 7 Spoon a small amount of batter into the pan and spread gently with the back of the spoon. 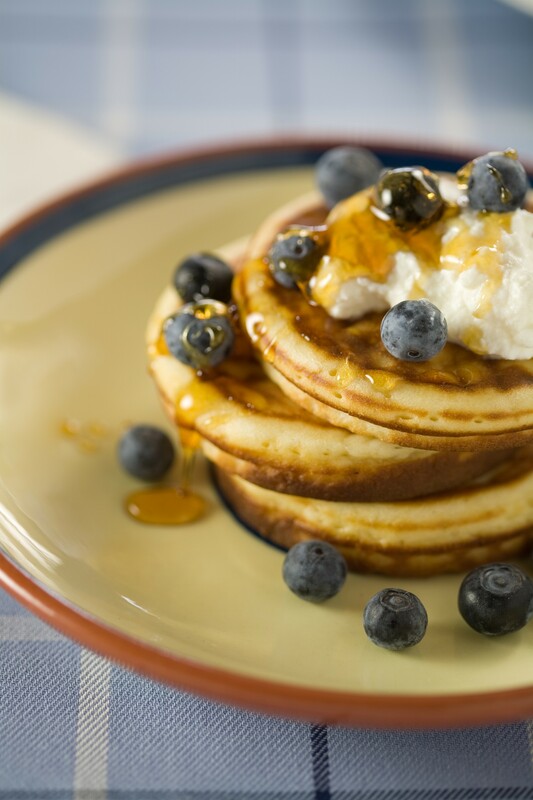 8 Drizzle pancakes with honey syrup and serve with Ricotta and fresh blueberries on top.